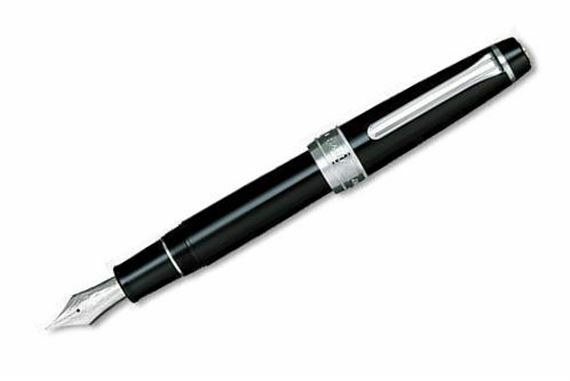 Order your Sailor Professional Gear Fountain Pen With Silver Trim today from FahrneysPens.com. Fine Pens, Refills & Luxurious Gifts – great prices & fast shipping. Always be prepared to get the job done right with the Sailor Professional Gear Fountain Pen with Silver Trim. Perfect for polished performance and businesslike precision, the Professional Gear pen will be ready to go every time you are. Based on Sailor's famous 1911 series, the Professional is a large, commanding pen turned in polished black resin with a rhodium-plated silver clip and trim. Pair this fountain pen with the matching twist-action ballpoint pen to create a powerhouse set of writing enjoyment, dependability, and professional good looks for many years to come. The Professional Gear fountain pen is fitted with a 21K gold and rhodium Sailor nib inlaid with a silver anchor logo. The fountain pen uses cartridge or converter fill.